FINAL All-Encompassing SGV(N) Top 25 for 2015 … WHAT A SEASON! 1. La Mirada (13-3) — Amazingly dominant postseason says it all. 2. San Marino (15-1) — Second-in-a-lifetime group of players. 3. La Habra (13-2) — Had most amazing moment of the season. 4. 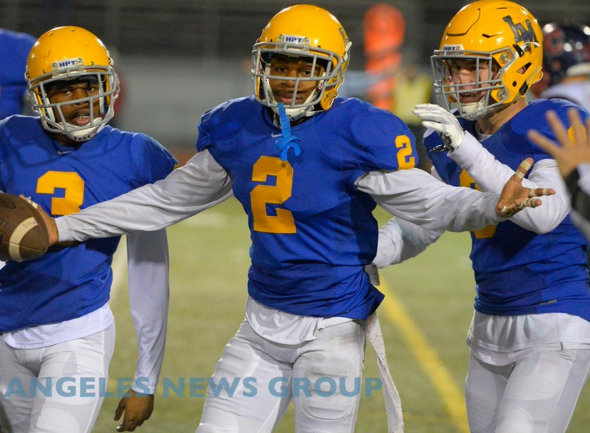 Bishop Amat (10-3) — Hit their ceiling hard in Pac-5. 5. Charter Oak (12-2) — To accomplish all that with ZERO size. Wow! 6. La Serna (11-3) — Another remarkable postseason by Lancers. 7. Glendora (11-2) — Sad to see QB Fink and strong senior class go. 8. St. Francis (9-4) — Coaching staff willed team to semifinals. 9. Northview (10-2) — Another fine season by HC Perez and crew. 10. Bonita (8-3) — Program is always in the conversation. 11. San Dimas (10-4) — Really put things together at the right time. 12. Diamond Ranch (7-4) — Drawing San Marino really hurt. 13. Los Altos (5-5) — Down year in ’15, but top 5 in ’16? 14. Monrovia (8-4) — Pretty good when 12-game season is a down year. 15. Baldwin Park (7-4) — What a job by Braves coach James Heggins. 16. Covina (7-5) — Colts finally had their moment in playoffs. 17. South Pasadena (8-3) — Late-season injury to best player hurt. 18. Arroyo (8-3) — League champs with first-year QB. 19. Arcadia (5-5) — Apaches look like program on the rise. 20. West Covina (4-6) — Bad luck started in the offseason. 21. South Hills (4-7) — Got going at right time of year again. 22. Maranatha (7-5) — Bogan wins even in rebuild mode. 23. Rosemead (5-6) — Time to ease up on nonleague schedule. 24. Rio Hondo Prep (6-4) — Northern Div. proved too tough. 25. Pasadena (5-5) — Turkey Tussle was perfect capper for ‘Dogs. 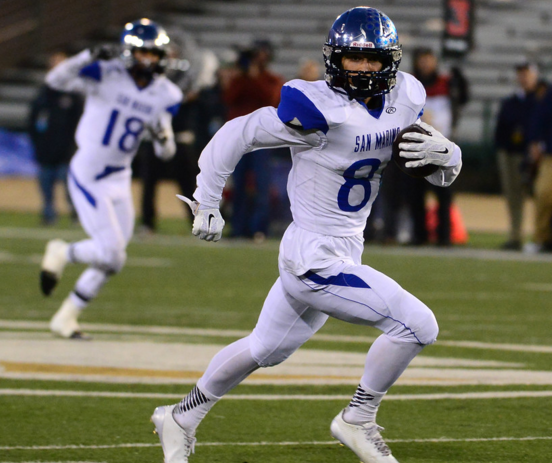 San Marino receiver J.P. Shohfi put an exclamation on his stellar season by setting the national single-season record for yards with 2,464 yards. Previous record was held by Cody Cardwell of Stephenville, Texas. It was 2,427 yards and stood since 1998. That’s a wrap on the postseason! La Mirada completed what was a simply dominant postseason with yet another runaway win over Campolindo to win the State Division III-AA bowl championship game on Saturday night. 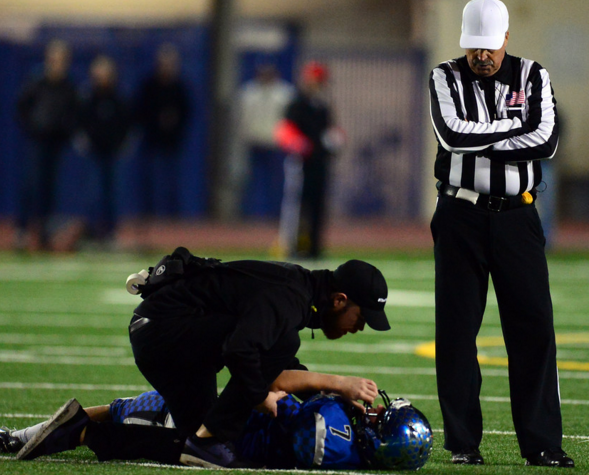 Meanwhile, up north, San Marino couldn’t get star QB Carson Glazier cleared to play by CIF. So, the shorthanded Titans gave it a good try but ultimately Central Catholic pulled away in the small schools bowl championship. On Monday, San Marino QB Carson Glazier, who leads the Southern Section in passing yards, vowed to play in Saturday’s small schools State Bowl championship against Central Catholic at Sacramento St. University. Glazier’s status is/was in doubt due to a head injury in last Saturday’s win over Sierra Canyon after he was slammed to the turf on a rough tackle late in the first half and was held out the rest of the game. Glazier has some concussion protocols put forth by CIF to pass this week before he can be cleared to play and (as of Wednesday) that hadn’t happened yet. Given the current climate in all levels of football as it pertains to head injuries, convincing CIF that Glazier wasn’t concussed last Saturday and that he’s okay enough this week to play may prove very difficult. Keep in mind that many people feel extending the season to 15 and 16 games puts kids at an unnecessary risk. And some of those people are CIF officials. So, there may be a bigger reluctance to risk someone like Glazier than usual. Certainly, injuries like this can happen in Week 2 just as easily as Week 15. But the fact is, in this case, it didn’t. I received an email from an area official who will remain nameless. The official said that NO WAY should Glazier be cleared in less than a week’s time after having such a serious moment last Saturday night. I must say, I agree. If you’ve ever talked to Glazier, you know he’s a great kid. Whole life ahead of him. Yes, he knows the risks. He’s a warrior and wants to fight. That’s all commendable. But what’s he risking it for? So CIF can make a few extra bucks? So the Sac-Joaquin Section can see whether they’re better than the Southern Section or other sections? NOBODY left Citrus College two weeks ago wondering where San Marino stacked up against the other small schools in the state. San Marino’s point was proven after Week 14. These kids and their coaches are already legends. Yes, last Saturday was a nice chapter to add. Thrilling, to say the least. But at what point does the reward outweigh the risk? San Marino 36, Sierra Canyon 35: The Titans won the southern regional small schools division bowl championship with a stirring rally to beat Sierra Canyon in a battle of undefeated teams. San Marino trailed 35-14 in the fourth quarter, and without QB Carson Glazier (head injury), things looked bleak. But the Titans rallied and took the lead for good with just over a minute to play on Mark Wicke’s 2-point conversion run. INCREDIBLE GAME! 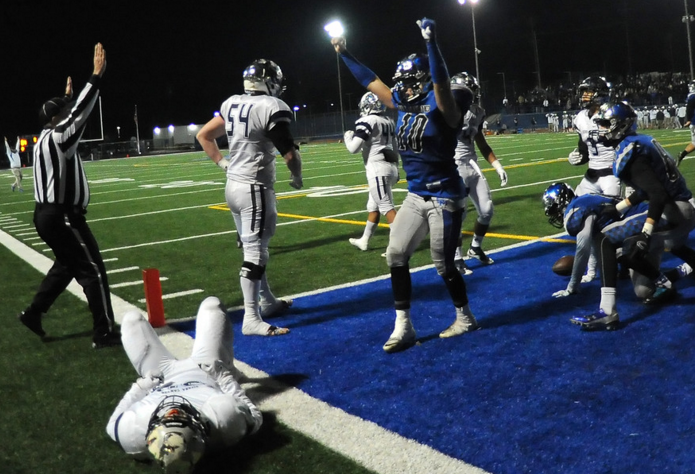 La Mirada 36, Oceanside 14: La Mirada continues to make mince meat of the postseason. The Matadores scored yet another blowout win, this time to win the southern regional Division III-AA bowl over Oceanside. QB Tristan Meyer has been amazing, as has running back Sei-J Lauago. The Mats host Campolindo in the State championship bowl next weekend. Camarillo 63, La Habra 49: The Higlanders simply couldn’t keep up with Camarillo’s high-powered pass attack. LH finished the season 13-2 and won the Southwest Division championship.